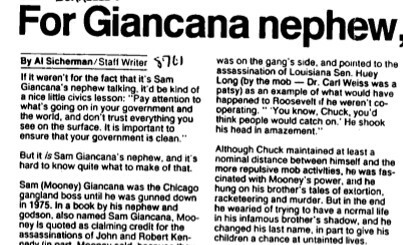 But it is Sam Giancana’s nephew, and it’s hard to know quite what to make of that. Sam (Mooney) Giancana was the Chicago gangland boss until he was gunned down in 1975. In a book by his nephew and godson, also named Sam Giancana, Mooney is quoted as claiming credit for the assassinations of John and Robert Kennedy (in part, Money said, because they weren’t going a long with the deals made with the mob by their bootlegger father – deals that helped get John elected president), the murder of Marilyn Monroe at the CIA’s behest, and practically everything else rotten that you could think of. Although Chuck maintained at least a nominal distance between himself and the more repulsive mob activities, he was fascinated with Mooney’s power, and he hung on his brother’s tales of extortion, racketeering and murder. But in the end, he wearied of trying to have a normal life in his infamous brother’s shadow, and he changed his last name, in part to give his children a chance at untainted lives. What young Sam, 38, the book’s author, makes of his heritage is even less clear. He was 14 when his name was changed. He continues to use the new name in private life; he uses Giancana only in connection with the book. He went to Marquette University (he was the first Giancana to earn a college degree, but it doesn’t say “Giancana”) and went on to a career in marketing and public relations, even opening his own communications firm specializing in written materials on health care. Although the book is about nothing but Mooney and the mob – and some would say it is retelling that lacks any moral view – the real lesson of the book, Giancana said, is not about the mob at all. What of his own feelings about being a Giancana? When he was growing up, he said, “it was hard for me to understand how somebody could steal or kill and murder. My parents told me early on about what the mob was and so forth. My childhood was a constant juggling of ethics and morals. On the one hand I’d hear it was OK to steal a little bit and he did is and he did that and it was all OK and people were getting ahead, but I was never to take anything, never steal, because it was not the right thing to do. “My parents told me he was a criminal, that it wasn’t right and that I was never to do anything wrong. More I think my parents wanted to be sure that I didn’t cause any pressure on them. They used to tell me when I was a young boy. “ Don’t ever get in trouble, because if you’re with people in trouble, they’re going to blame you because you’ve got the name. And then if your name is in the paper, it’s going to put light on your uncle and he doesn’t want that publicity. So I lived this model childhood. I never got it trouble.